Each year for my birthday I always make it my business to sow into the lives of others thru various retreats and brunches, and as I approach this new year of life I am being very intentional in my sowing. I've been blessed with amazing mentors throughout my life that have lead, guided and positioned me to live in my destiny. And in honor of birthday, I want to gift this wisdom and love to a deserving 22-35 year old woman in my birthday month of April. I vividly remember my 20's and 30's as the years that I was most confused and needed a listening ear coupled with words of wisdom and understanding - and I had it. If it wasn't for the love and guidance of my tribe I would have succumb to the issues of life. It's my desire to gift this to a young woman in need of that same encouragement. If you desire to know how to live beyond your current situation, it is my life purpose to help you discover the abundant life intended for you. I will intimately work with you for 30 days through my encouragement and mentorship program using the exact tools that I used to reinvent my life to birth destiny and fulfillment. If you feel this is something that you need in your life, complete the questionnaire below and you will be contacted for a brief consultation. So go ahead and submit the application below to be entered into the drawing. If you know someone who could benefit, share with them. The recipient of the gift will be chosen by a random selection on my birthday, April 27, 2017. 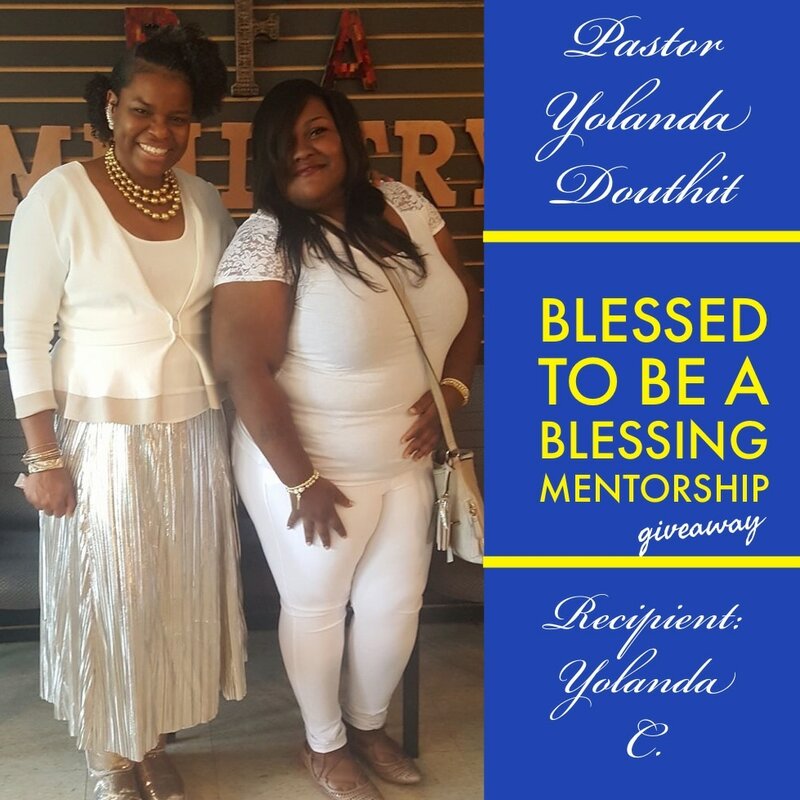 The recipient of the "Blessed to be a Blessing" Mentorship Giveaway has been selected and it is a young woman that's my namesake, Yolanda C. She will have free access to all of my especially designed encouragement programs and total access to me. And I am so honored to be able to gift my life to this young woman who has already made great strides in the last few years and I am looking forward to pouring the wisdom and love I have been blessed to receive in my life into her so that she can live the most abundant life ordained for her. It gives me so much joy to be able to sow into her life. 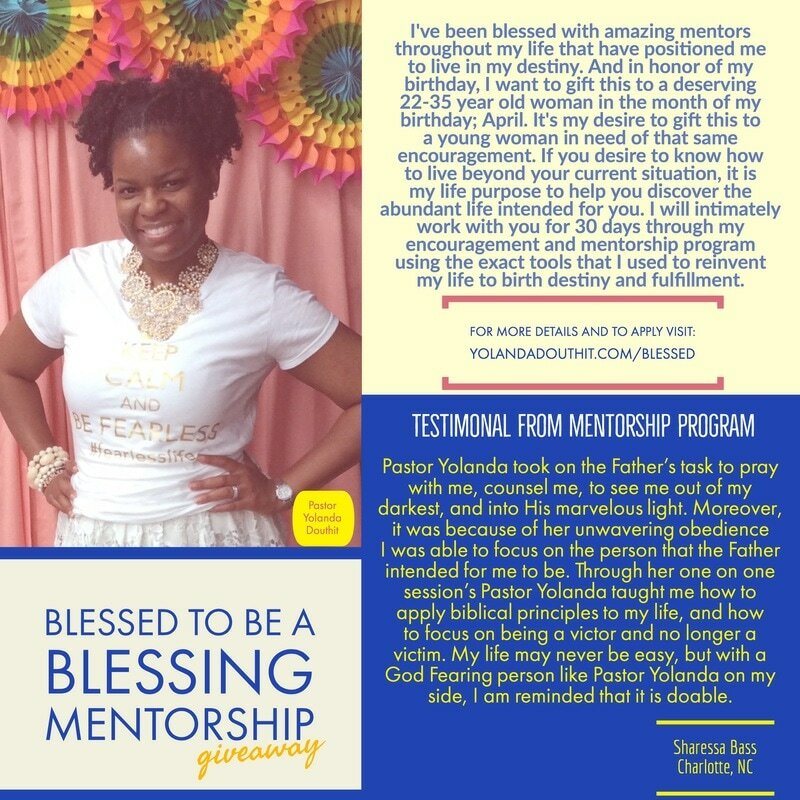 Learn more about Yolanda D.
To learn more about Pastor Yolanda mentorship, one on one sessions or to speak at your next event - click the links.